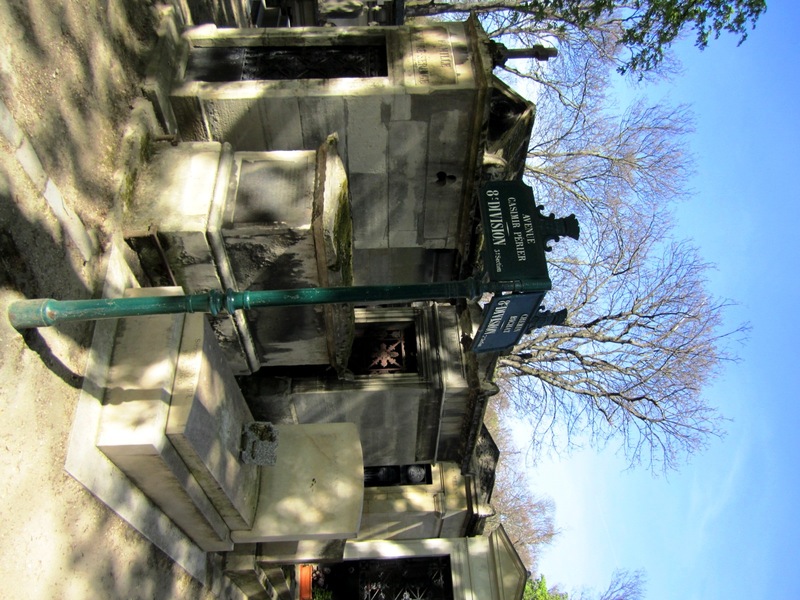 One of the things I have always wanted to visit in Paris is the famous Père Lachaise Cemetery. 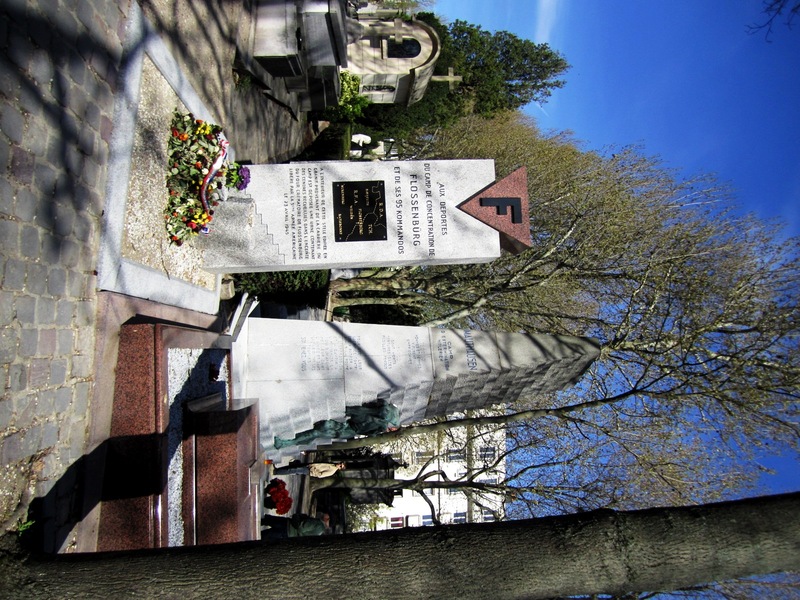 Père Lachaise Cemetery (French: Cimetière du Père-Lachaise, [simtjɛːʁ dy pɛːʁ laʃɛːz]; officially, cimetière de l’Est, “East Cemetery”) is the largest cemetery in the city of Paris, France (44 hectares (110 acres)),though there are larger cemeteries in the city’s suburbs. 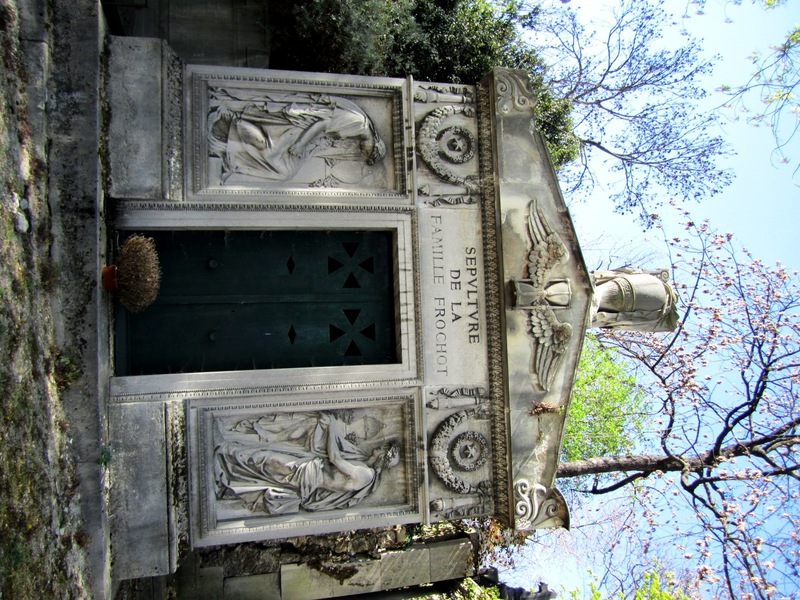 Père Lachaise is in the 20th arrondissement, and is reputed to be the world’s most visited cemetery, attracting hundreds of thousands of visitors annually to the graves of those who have enhanced French life over the past 200 years. 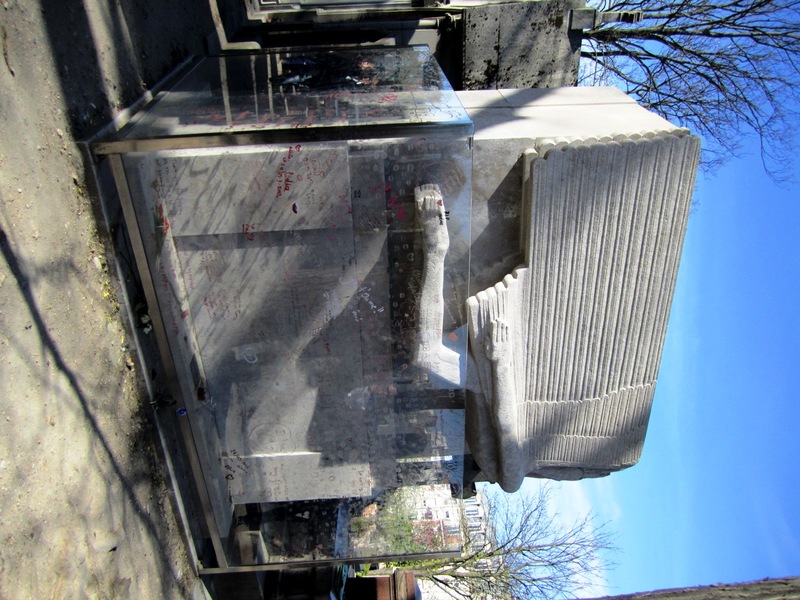 It is also the site of three World War I memorials. 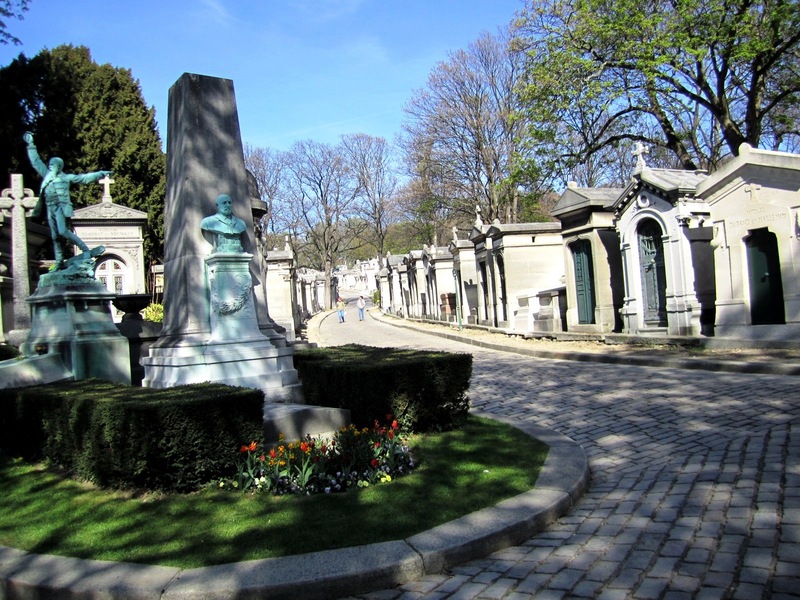 The cemetery is on Boulevard de Ménilmontant. The Paris Métro station Philippe Auguste on line 2 is next to the main entrance, while the station called Père Lachaise, on both lines 2 and 3, is 500 metres away near a side entrance. 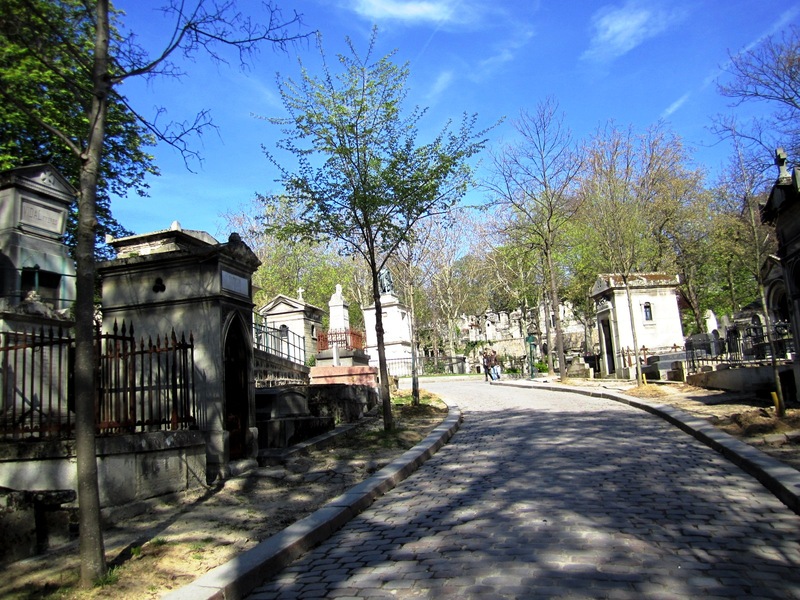 Many tourists prefer the Gambetta station on line 3, as it allows them to enter near the tomb of Oscar Wilde and then walk downhill to visit the rest of the cemetery. 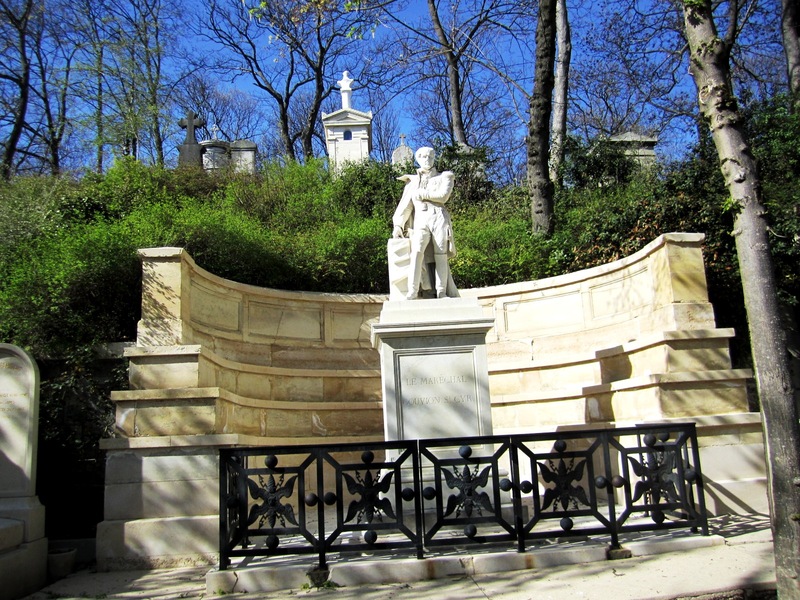 Père Lachaise Cemetery was opened on 21 May 1804. 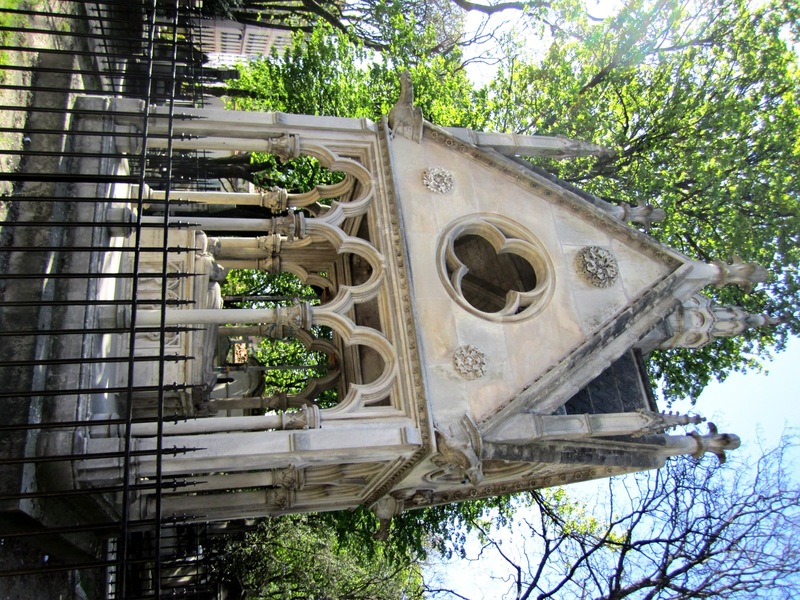 The first person buried there was a five-year-old girl named Adélaïde Pailliard de Villeneuve, the daughter of a bell-ringer of the Faubourg St. Antoine – I tried to understand what this bell-ringer was about, the closest thing I could come was some kind of position at a police station, maybe! 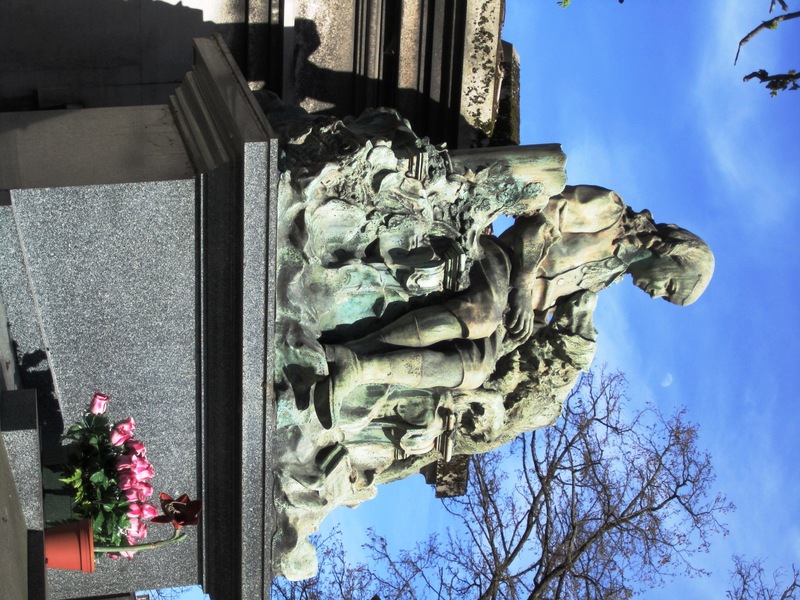 Napoleon Bonaparte as a consul declared that “Every citizen has the right to be buried regardless of race or religion”. 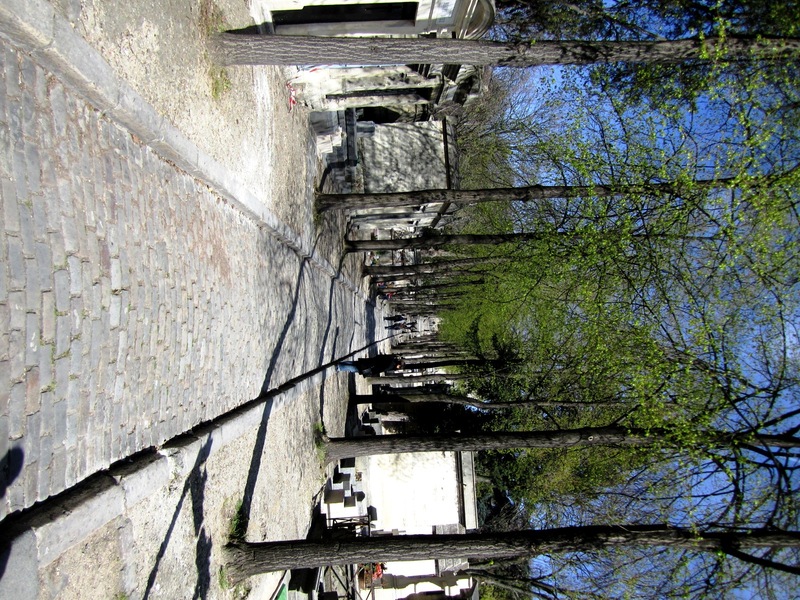 Although some sources incorrectly estimate the number of interred as 300,000 in Père Lachaise, (I believe that’s the number of the major graves), according to official website of the city of Paris; to date, one million people have been buried there.Along with the stored remains in the Aux Morts ossuary, the number of human remains exceeds 2–3 million in Père Lachaise cemetery. 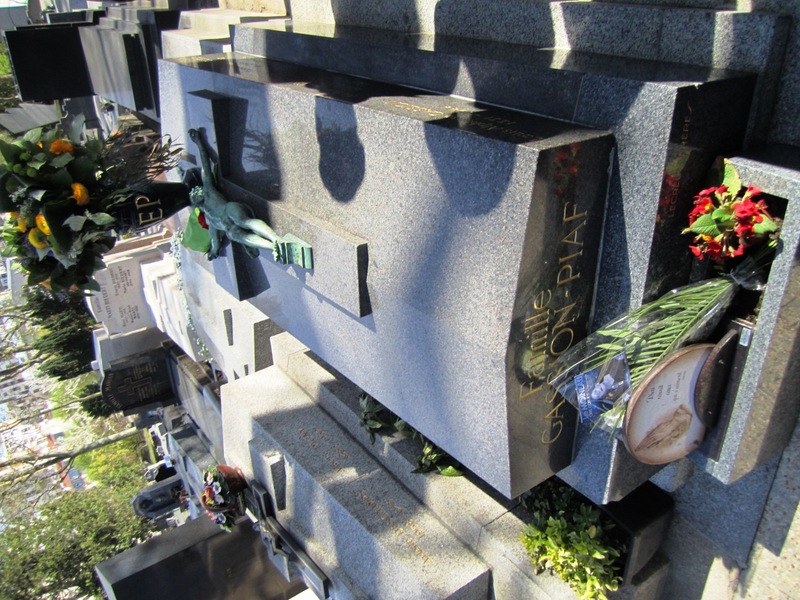 A very popular grave is Edith Piaf‘s – by the way please say [éditt], like the French, do not pronounce the ‘th’. We had some difficulty finding her, but then we just followed a large group of tourist with their tour guide. Easy! 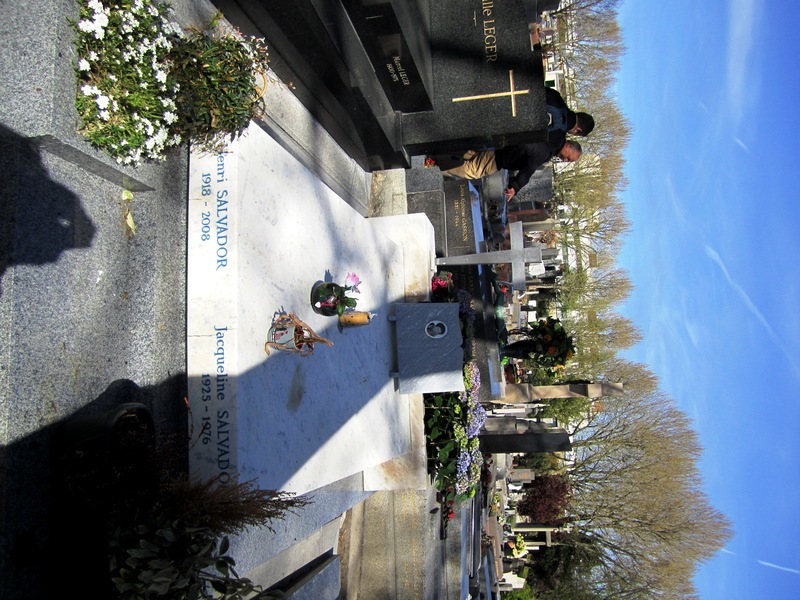 And we stumbled upon Henri Salvador, another famous French singer, though of course not as popular oversees. 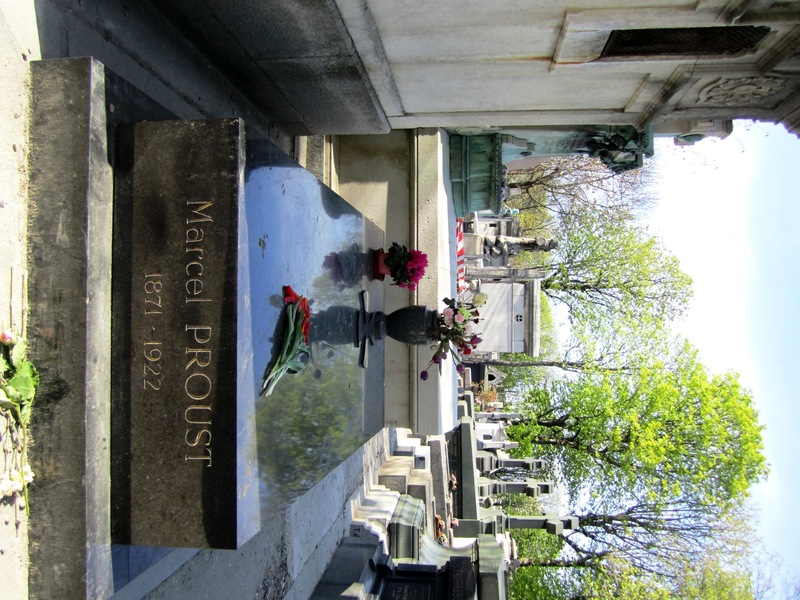 Marcel Proust’s link goes to one of my reviews of his great work. Two other famous people, or rather 3! 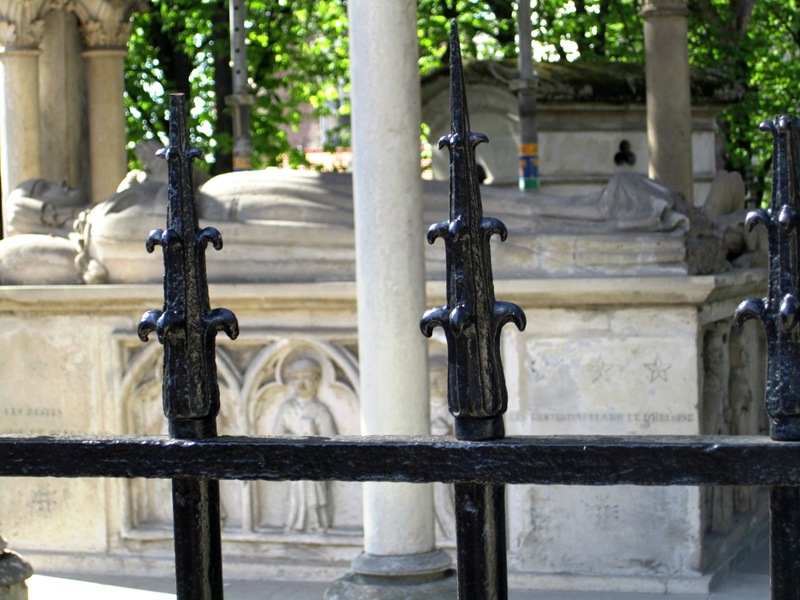 This is the grave of Héloïse and Abélard, probably the most famous lovers of the Middle Ages. This is probably the best representation of the expression “time flies” I have ever seen! Child represented with his dog Inventor with his machine! 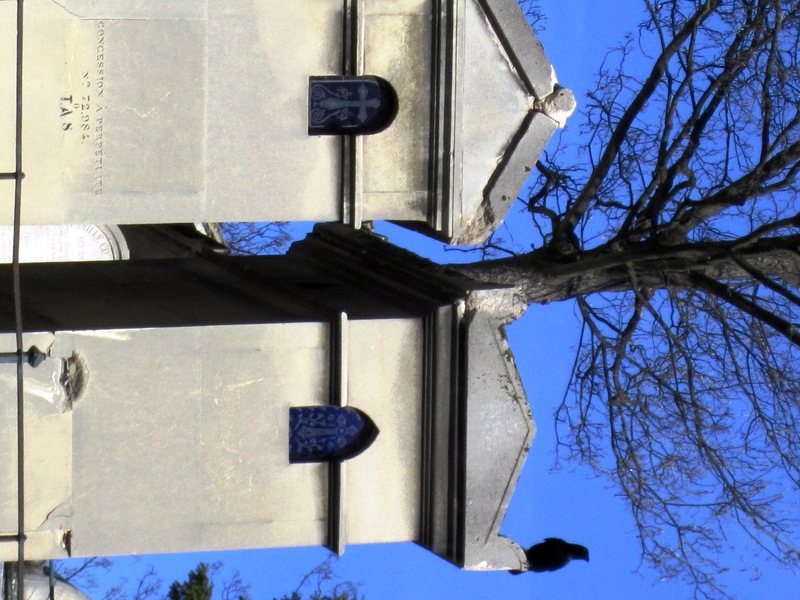 It says that the people buried there died at 28,000 feet! I was intrigued and then read that they had been the victims of a balloon accident! 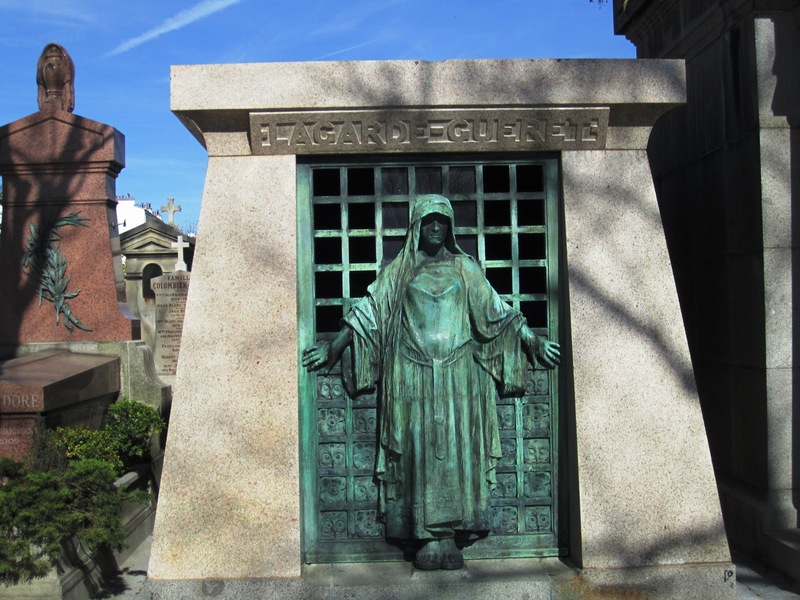 If you want more and see by yourself, there’s a fantastic virtual tour, you can see absolutely everything, choose the tombs you want to visit, and wander from street to street. 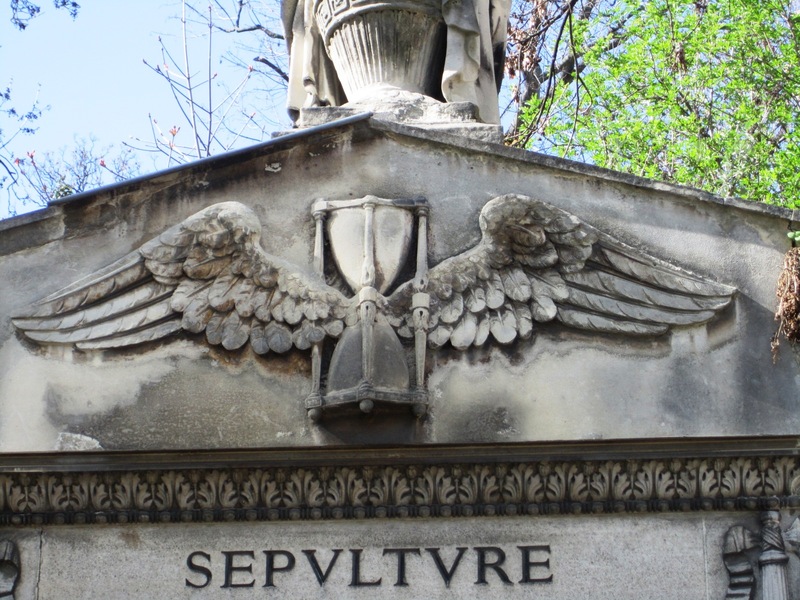 HAVE YOU EVER VISITED THIS CEMETERY? 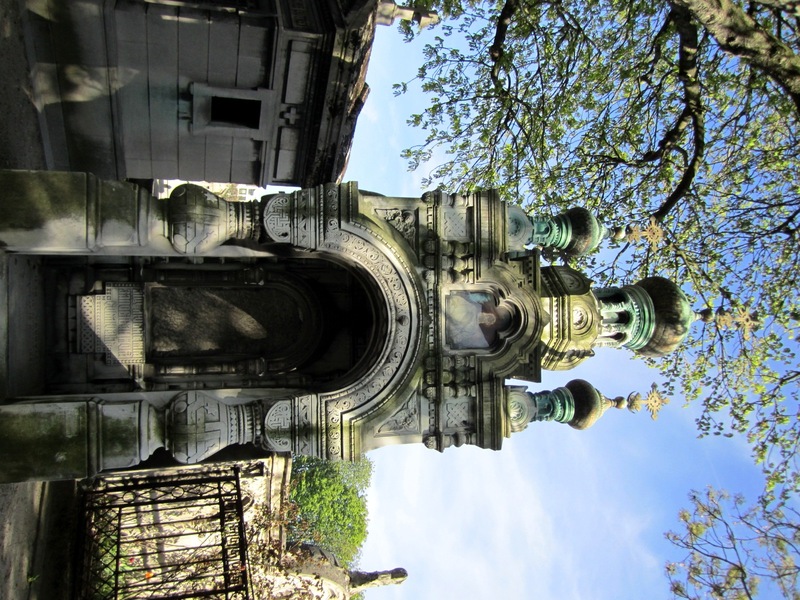 This entry was posted in I Love France, Photos and tagged cimetière, I love France, Paris, Père Lachaise cemetery by WordsAndPeace. Bookmark the permalink. Thank you for the great pictures. When I lived 4 years in the Ramstein, Germany area, I took the bus as often as possible (about 8 times with and without my children) to beautiful Paris. 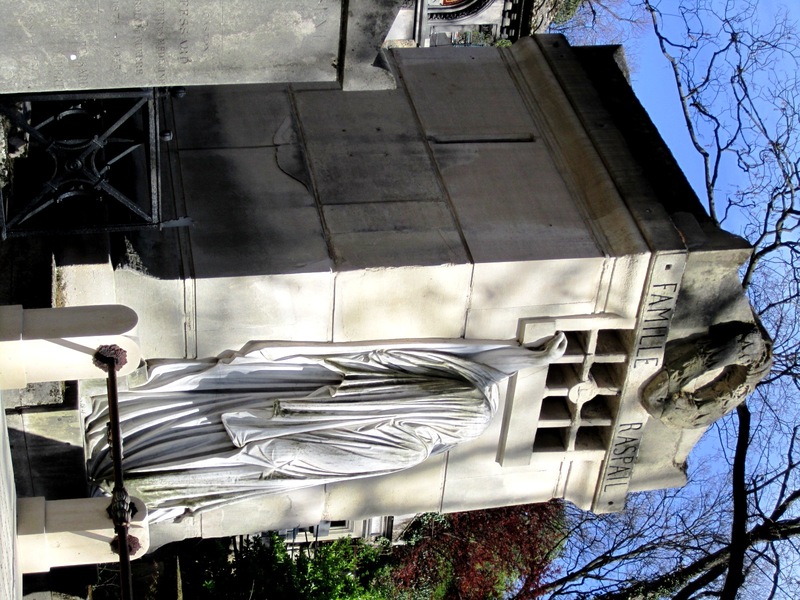 The ONLY area I was confused in the Metro to get back to the Orsay was from Pere Lachaise. 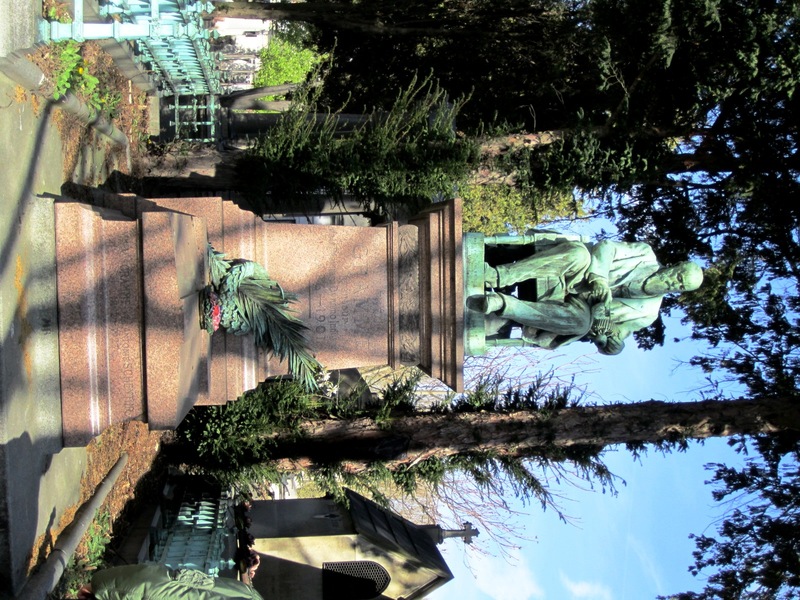 I also had to catch the bus back to Germany, so I missed a great deal of the cemetery. Didn’t realize at the time so many famous people were interned there.Thanks so much. I love your new meme – great idea. I will be posting in the future for sure! Thanks, yes please link your French posts. I love your pictures – if you are at megtrublue. your ID did not show any website, so I looked up on google. I’m not megtrublue, but if you click on my dragonfly icon it should take to Brona’s Books…which is me! hmm, how did I miss it?? I’ve added you to my google reader. Thanks so much for adding my meme on Book blogs. I thought I had signed up to that some time ago. time to look at it again and resurrect it. This is great and the pics are breathtaking. Did you know Alyce from At Home With Books does a Saturday meme called Saturday Snapshots? This would be a great place to link up your pictures as well – they are really good. I am still kicking myself for missing this when I was in Paris. Next time! Good for you! 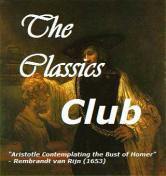 And I just added you to my google reader to follow your beautiful blog. if you are looking for extra resources to become fluent in French, don’t hesitate to ask. I have found tonsof them, for free online. for instance, you say you listen to French radio. do you know you can also watch French tv channels for free online. I would recommend watching le Journal télévisé of tf1. it’s exactly as the french watch it at 1:30 pm or 8:00 pm daily. it is on tf1.fr. click on “revoir le JT” under the big moving picture. if you cannot find it, google it, it will lead you the tf1 links. it’s actually easier to watch tv than listen to the radio, because of the visual support. I always recommend this to my students. ask if you need something specific. and if you need conversation with a French native, we can arrange something. i have lots of online students, we use skype [free to install and use – you do NOT need a webcam, just hearphones]. my fee is $20/hour. I could have written all this in French, but am not sure what your level is so far. This is all brilliant, and so helpful thank you! I’m really just a beginner, I did the O level at school but that was over 20 years ago, and I haven’t really used French since. So I’m starting all over again. It’s amazing what’s flooding back though! Thank you for all these resources, I will start working my way through. You are most welcome. Just ask if you need anything else. 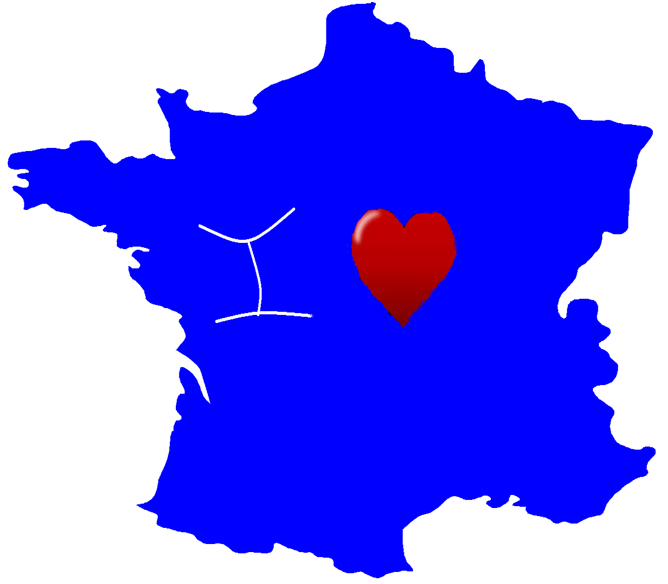 There are also tons of fun, free, and easy interactive games for French beginners. When I have time…, one of my dreams is to post these lists of great resources I use daily with my students. Yes, whatever language you stored in your brain many years before comes back when prompted. Oh my, how beautiful this is! 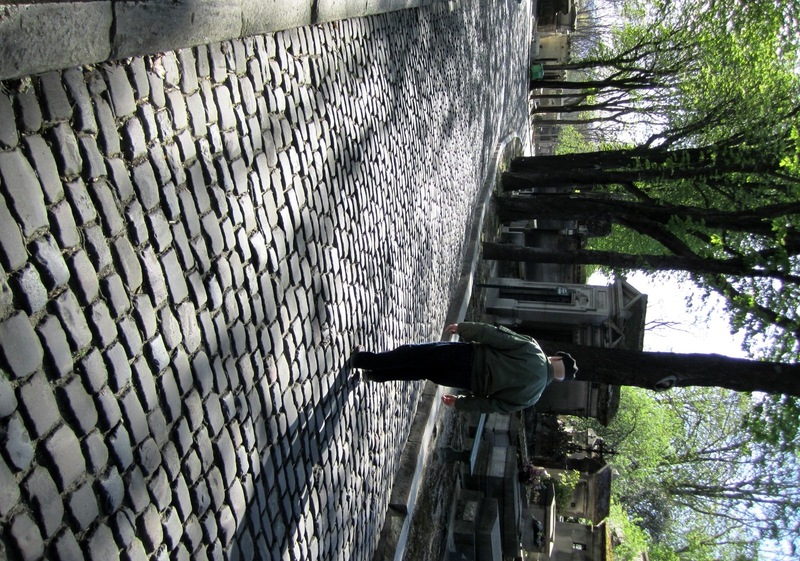 I loved seeing the French man walking down the cobblestone path. I wish I could go right now. A great post and a very nice blog! 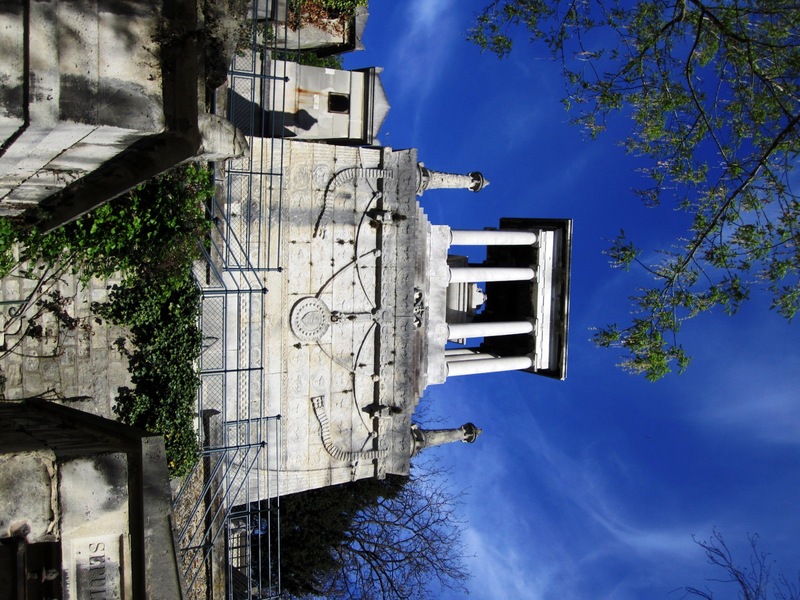 I don’t like cemeteries but this one is so steeped in history that I might be tempted one day! 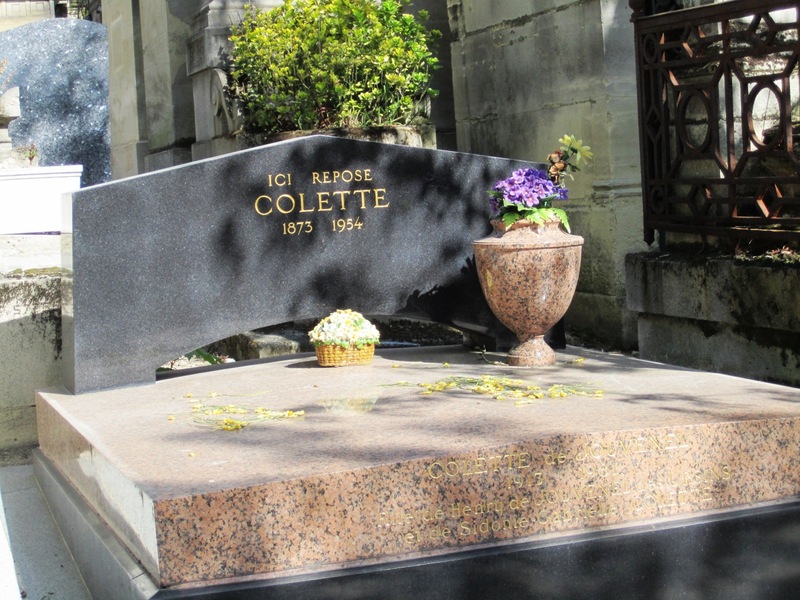 Colette! Heloise and Abelard! I started French Friday back in 2009. I took a break from blogging last year and came back to it recently. Next week will be my 50th French Friday, so I’ll be having a French giveaway, if you’re interested! 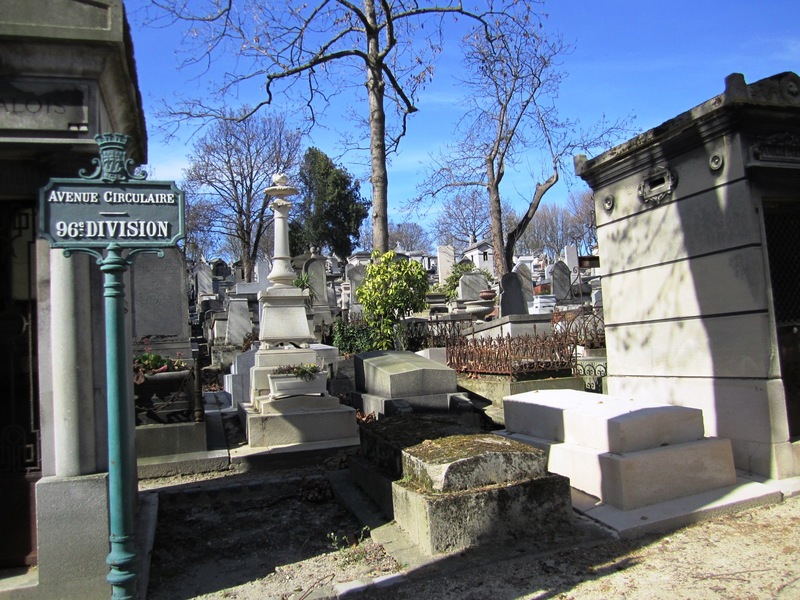 I’ve lived in Paris for five years but only visited the Père Lachaise once… For Jim Morrison, mainly… 🙂 Lovely pictures! Thanks so much Charlotte for highlighting my meme. I’m now following you and the other bloggers you mentioned. I also just sent you an email for a possible French Friday guest post! glad to have you back in the blogoshpere, a fun place to live in! 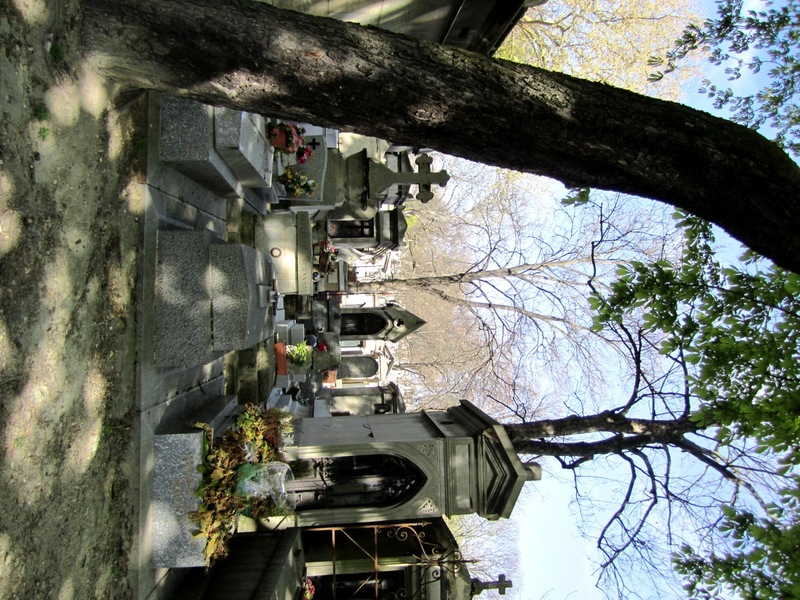 cemetery could be this nostalgic, romantic, beautiful! 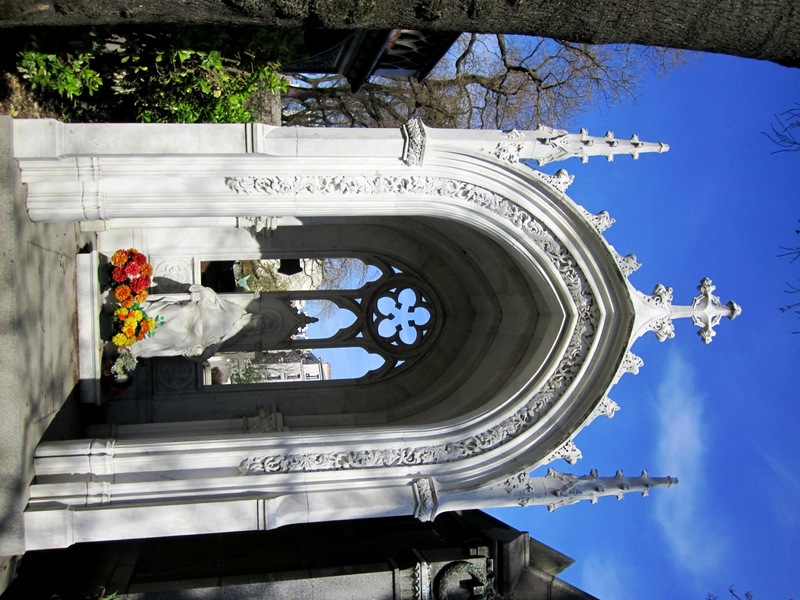 I’ve been to Paris 10 times and I’m embarassed to admit that I’ve never visited Pere Lachaise Cemetery. Your photos are gorgeous. What a clear sky you had on your visit. 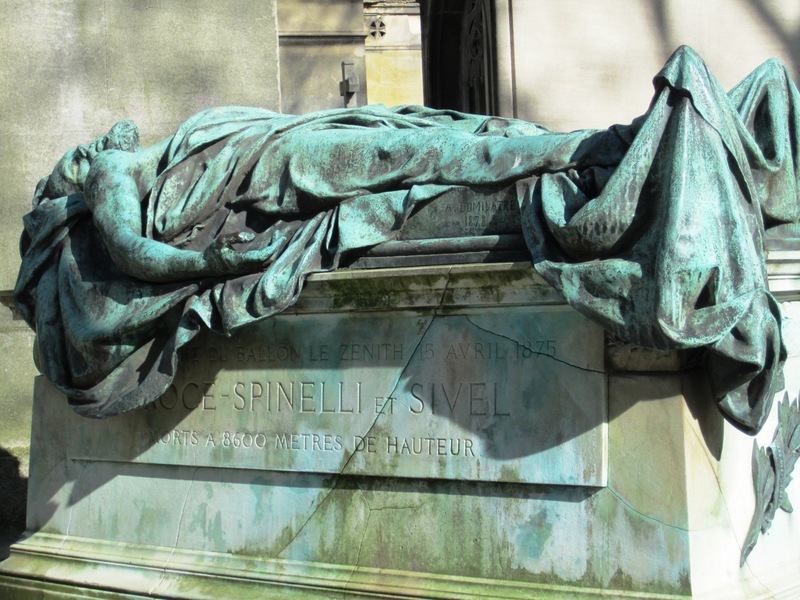 so you have something for your next Paris visit! 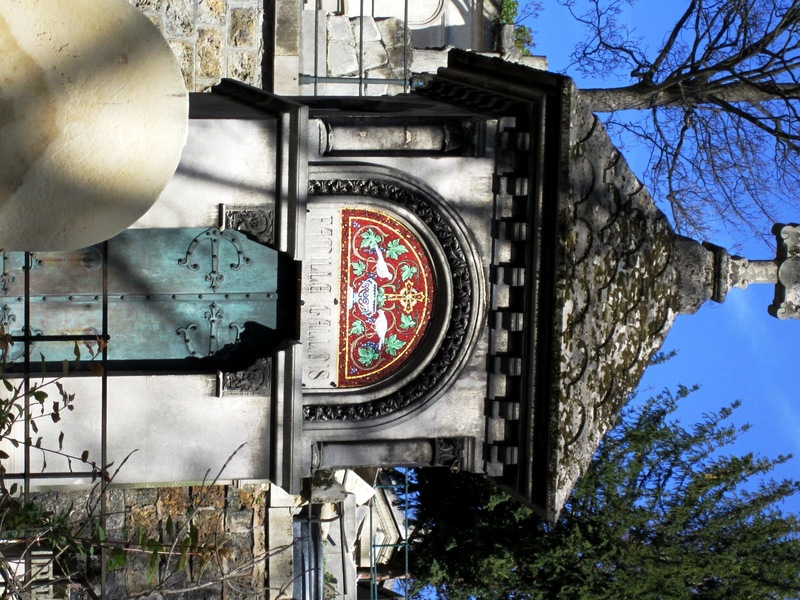 we had an extraordinary early Spring in France, so unusual, no rain. Beautiful photos! I especially love the one of the man.